The marathon season begins with the hint of winter in Mumbai. They are held in various categories and all over Mumbai. Running is considered the best exercise and what can be better than parents getting an opportunity to do a 2k and 5k marathon with their kids. 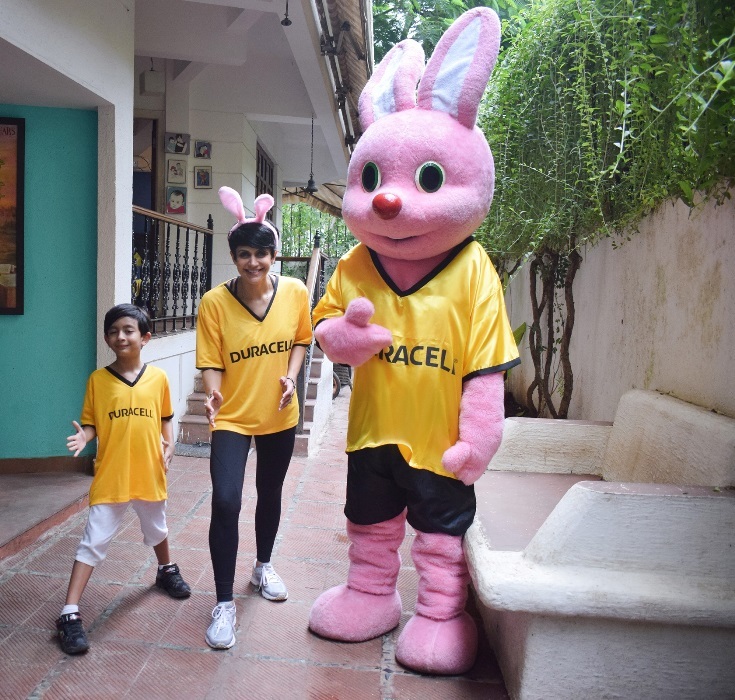 It’s the only-one-of-its-kind marathon in India and called the Duracell Durathon. Well known celebrity and fitness expert, Mandira Bedi will soon participate in the third edition of the Durathon being held at Jio Gardens, BKC in Mumbai on 25th November. She will run with her 7-year-old son, Vir. Mandira speaks about the importance of including family in all aspects of our lives to be healthy and her passion for fitness as she & Vir prepare for the Durathon. Tell us about your association with Duracell Durathon 2018? This will be the third time that I associate with the Durathon and it’s my second run for the Mumbai Durathon. I have also participated in the Delhi Duarthon last year. It is such a wonderful feeling, spending that one Sunday with my son and seeing so many families out and about, running, bonding and having a purpose, that is staying healthy together. What is your opinion on the concept of Duracell Durathon? These days most kids lead a very sedentary lifestyle, what should parents do to make their kids more fit or active? That is indeed true that children are leading a very sedentary lifestyle. Little kids want to spend time watching television or they are addicted to video games. So, I think parents needs to insist that a little bit of playtime needs to happen outdoors. Kids can go to the park and run around. They need to enjoy childhood the way it was done before technology took over. Parents should make it a point that their children should spend a fair amount of time outdoors doing stuff that requires being active. How do you ensure that your family stays fit? I have plenty of arguments with my husband over exercising and he barely does what he has to, maybe two-three days a week. But for my son, I make sure he does what he enjoys doing. He enjoys running so him and I go for runs. Short runs, not very long distance where I run slowly and he keeps the pace with me. He enjoys swimming too. One hour of swimming in the pool gets him super tired and gets him super hungry. He is a very active boy. Which is your favourite form of exercise? I do a form of HIIT (high-intensity intermittent exercise) where I mix cardio and weights. I do that quite often enough. I also go for runs every now and then. The third thing I do is swimming. So, these are the three activities that I perform the most as far as my exercise is concerned. Is there any particular activity that you and your family do together to keep fit? As I mentioned before, the only two activities my son and I do together to keep fit are running, slow jogging and swimming. An increasing number of people are running to stay fit. What is your advice to runners? The advice I would give to runners is start slow. Start with a smaller goal in mind and keep building that up. I remember the time I was pregnant. After I delivered, I wanted to start running again but there was a lot of weight on me and there was a lot of pressure on my knees when I ran. So, I started running with five minutes, built that up to seven and built it up to ten. So, start slow and start with smaller goals and keep building on those goals. Over time you’ll find yourself getting better.